You can write template text when you define your events. This template can include qualificators like %1, %2, etc. Qualificator defines variable part of event. Each logged event will contain reference to template's text, so template's text is not stored into log itself (thus, saving storage space). But any dynamic content for qualificators will be stored inside log. When you're viewing log - dynamic content will be inserted into qualificator's positions and form a full error message. 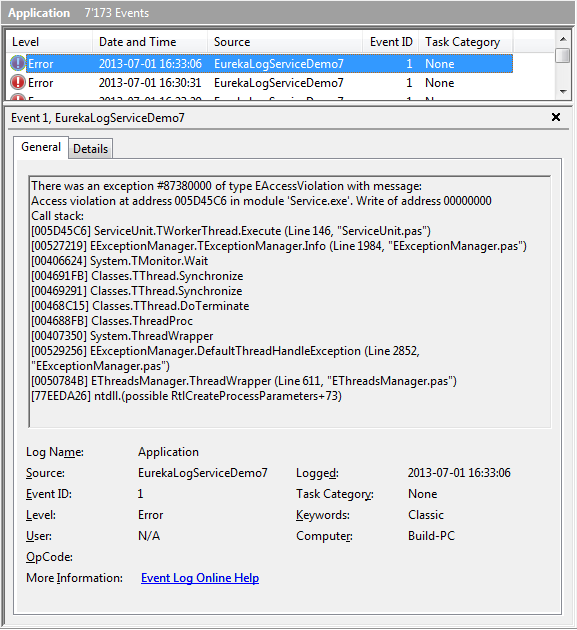 EurekaLog defines two qualificator by default: exception message and full path to bug report file. which you can override to define your own dynamic content. You can use ExceptionInfo property of dialog class to get access to different properties of logged exception in question. You can also use BugReport property to gain access to bug report content. The following example defines 4 custom dynamic pieces: %1 for exception message, %2 for exception type, %3 for compact call stack, %4 for BugID.